• Co-created with Teddy Charles, Strength & Hydration Expert from Paris, so you will always have HAIR ON YOUR SIDE. • More bounce, more life! This exclusive formula, with Biotin, gives your hair more body and bounce. **Due to less breakage vs. non-conditioning shampoo. With use of shampoo and conditioner system. 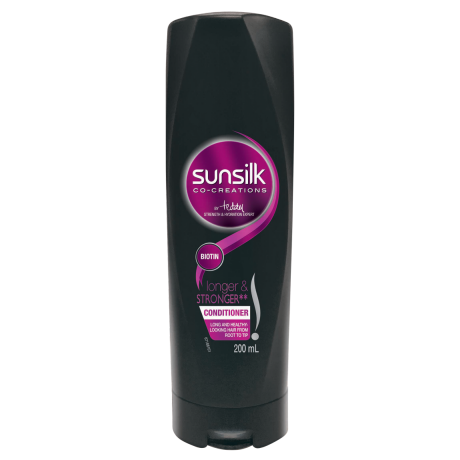 For even more incredible hair, why not combine it with Sunsilk Longer and Stronger Shampoo? Water, Cetearyl Alcohol, Stearamidopropyl Dimethylamine, Behentrimonium Chloride, Dimethicone, Biotin, Helianthus Annuus (Sunflower) Seed Oil, Amodimethicone, Peg-7 Propylheptyl Ether, Cetrimonium Chloride, Cyclotetrasiloxane, Dipropylene Glycol, Lactic Acid, Sodium Chloride, Disodium Edta, Methylchloroisothiazolinone, Methylisothiazolinone, Phenoxyethanol, Fragrance.